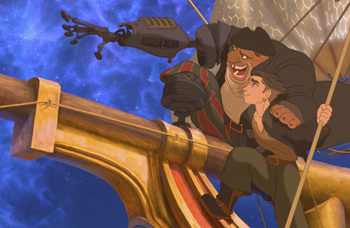 I approached Treasure Planet optimistically, having been sucked in by beautiful poster artwork and eye catching, if far fetched, trailers. 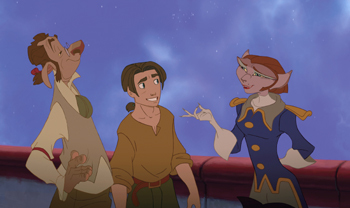 Unfortunately, Treasure Planet is just another retread on a story that was being remade decades before most of us were even born. 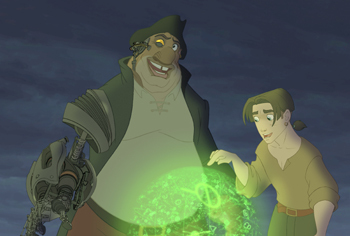 The only thing that really sets Treasure Planet apart from the 20 other movies on the same subject, most named "Treasure Island", is that like every film this year it finds a way to work surfing into the story. Yes, like any movie geared towards kids, or even hoping to pull in some segment of the teen to pre-teen audience, Treasure Planet is a movie about how cool skater punks really are. 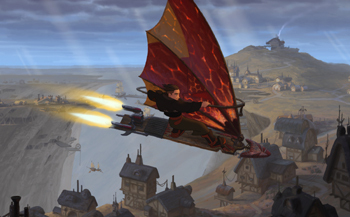 In fact, Jim Hawkins is a skater punk, as the movie opens with him surfing through the clouds on a rocket powered version of today's angst ridden teen's ride of choice. Typically troubled he surfs too wildly and gets hauled home by the cops where his mom proclaims him brilliant but troubled. From there the story is exactly like every other Treasure Island movie you've ever seen, including the older (and better) Disney ones. Jim and his mom operate a run down tavern where sailors… no sorry, SPACE sailors carouse and hang out. Jim's father is gone, this time as a result of abandonment rather than death. Billy Bones wanders in and gives Jim a treasure map. Jim takes the map and heads off for adventure on the high seas… er wait, sorry, the high STARS aboard a spaceship that looks exactly like a beautiful old sailing galleon. Surprisingly, therein lies Treasure Planet's only REAL strength. Its outer space setting makes it a gorgeous, if totally improbable, film. The ship designs are jaw-droppingly breathtaking as they plow through the vast beauty of a very fanciful depiction of space. Outwardly, they appear to be ancient schooners, all wooden planks and full-masted sails. Inside they are a mass of electronics, the sails providing power gleaned from the stars to electrify massive rocket engines nestled comfortably on the ship's stern. In Treasure Planet space is not a dark and empty place, but rather just another massive ocean teaming with life, color, and apparently air. Scientific? No, but visceral and powerfully visual just the same. Had I spent 90 minutes simply watching pirate ships do battle in that succulently starry void, it would have been easy to walk away satisfied. But this is a Treasure Island remake which means lots of meandering around doing everything that's already been done before. Once off for adventure Jim encounters the duplicitous John Silver, sporting cybernetics in place of his traditional peg leg, and a shape-shifting blob instead of a parrot. From there things happen as we know they must. 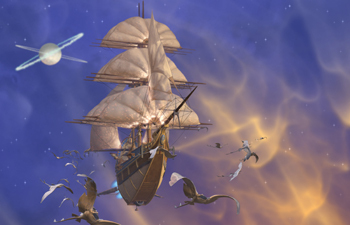 Sticking almost PAINFULLY to the classic story we've all known and loved, Treasure Planet cruises on and on repeating over and over again everything from every other Treasure Island movie, substituting laser rifles and flying schooners for flintlocks and rowboats. I love the classic Treasure Island tale, and I guess Disney's done a decent enough job retelling it here. The problem is simply that all they're doing is retelling it. Setting it in space doesn't change the fact that we've all seen this story 100 times over. Had they really gone out on a limb and tried to make it into something new, to churn out something markedly different from the Treasure Island tales we all already love, then maybe this would have been something worth remembering. 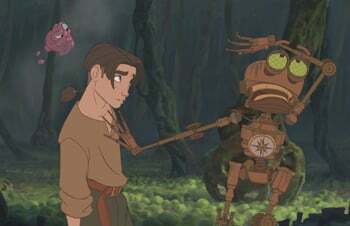 As it is, despite some nice voice work and decent character interaction, Treasure Planet is basically written as a plastic cookie-cutter Disney film. It works to make room for them to fit in all the funny types of spastic characters that have become almost a prerequisite for this type of Disney film without forcing Disney to come up with any new thoughts from their increasingly dry idea well.